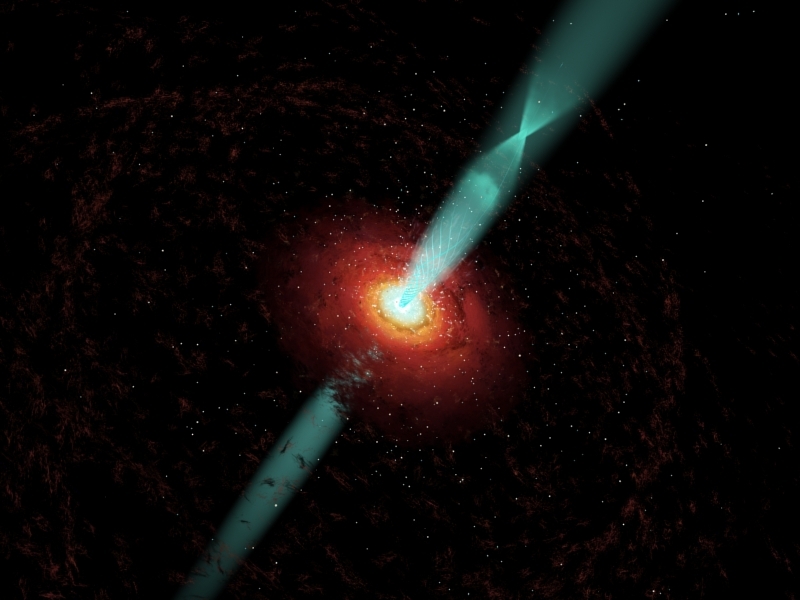 At the cores of many galaxies, supermassive black holes expel powerful jets of particles at nearly the speed of light. Just how they perform this feat has long been one of the mysteries of astrophysics. The leading theory says the particles are accelerated by tightly-twisted magnetic fields close to the black hole, but confirming that idea required an elusive close-up view of the jet's inner throat. Now, using the unrivaled resolution of the National Radio Astronomy Observatory's Very Long Baseline Array (VLBA), astronomers have watched material winding a corkscrew outward path and behaving exactly as predicted by the theory. Cosmovision, NRAO/AUI/NSF). Click on image for high-resolution file. "We have gotten the clearest look yet at the innermost portion of the jet, where the particles actually are accelerated, and everything we see supports the idea that twisted, coiled magnetic fields are propelling the material outward," said Alan Marscher, of Boston University, leader of an international research team. "This is a major advance in our understanding of a remarkable process that occurs throughout the Universe," he added. Marscher's team studied a galaxy called BL Lacertae (BL Lac), some 950 million light-years from Earth. BL Lac is a blazar, the most energetic type of black-hole-powered galactic core. A black hole is a concentration of mass so dense that not even light can escape its gravitational pull. Supermassive black holes in galaxies' cores power jets of particles and intense radiation in similar objects including quasars and Seyfert galaxies. Material pulled inward toward the black hole forms a flattened, rotating disk, called an accretion disk. As the material moves from the outer edge of the disk inward, magnetic field lines perpendicular to the disk are twisted, forming a tightly-coiled bundle that, astronomers believe, propels and confines the ejected particles. Closer to the black hole, space itself, including the magnetic fields, is twisted by the strong gravitational pull and rotation of the black hole. Theorists predicted that material moving outward in this close-in acceleration region would follow a corkscrew-shaped path inside the bundle of twisted magnetic fields. They also predicted that light and other radiation emitted by the moving material would brighten when its rotating path was aimed most directly toward Earth. Marscher and his colleagues predicted there would also be a flare later when the material hits a stationary shock wave called the "core" some time after it has emerged from the acceleration region. "That behavior is exactly what we saw," Marscher said, when his team followed an outburst from BL Lac. In late 2005 and early 2006, the astronomers watched BL Lac with an international collection of telescopes as a knot of material was ejected outward through the jet. As the material sped out from the neighborhood of the black hole, the VLBA could pinpoint its location, while other telescopes measured the properties of the radiation emitted from the knot. Bright bursts of light, X-rays, and gamma rays came when the knot was precisely at locations where the theories said such bursts would be seen. In addition, the alignment of the radio and light waves -- a property called polarization -- rotated as the knot wound its corkscrew path inside the tight throat of twisted magnetic fields. "We got an unprecedented view of the inner portion of one of these jets and gained information that's very important to understanding how these tremendous particle accelerators work," Marscher said. In addition to the continent-wide VLBA, an array of 10 radio telescopes spread from Hawaii to the Virgin Islands, the team used telescopes at the Steward Observatory, the Crimean Astrophysical Observatory, Lowell Observatory, Perugia University Astronomical Observatory, Abastumani Astrophysical Observatory, NASA's Rossi X-Ray Timing Explorer, the University of Michigan Radio Astronomy Observatory, and the Metsahovi Radio Observatory. The astronomers reported their findings in the April 24 issue of the journal Nature.